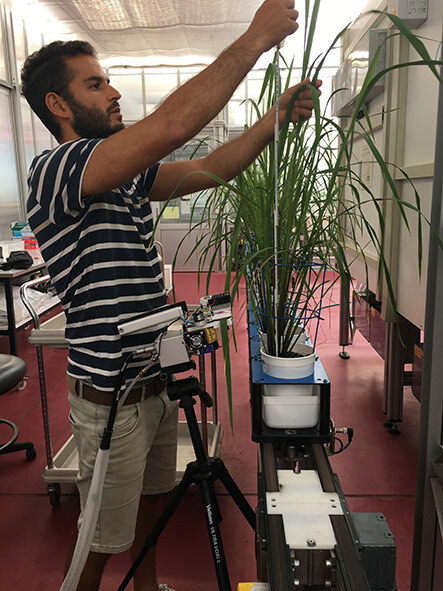 A team of scientists from the University of Sydney, Macquarie University and the Australian Plant Phenomics Facility (APPF) have identified a novel source of salt tolerance in an endemic Australian wild rice species. 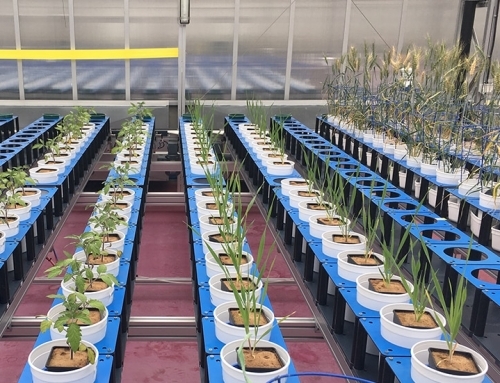 Recently published in ‘Rice’, the results represent a major step forward in the quest for enhanced salt tolerance in commercial rice cultivars in Asia. 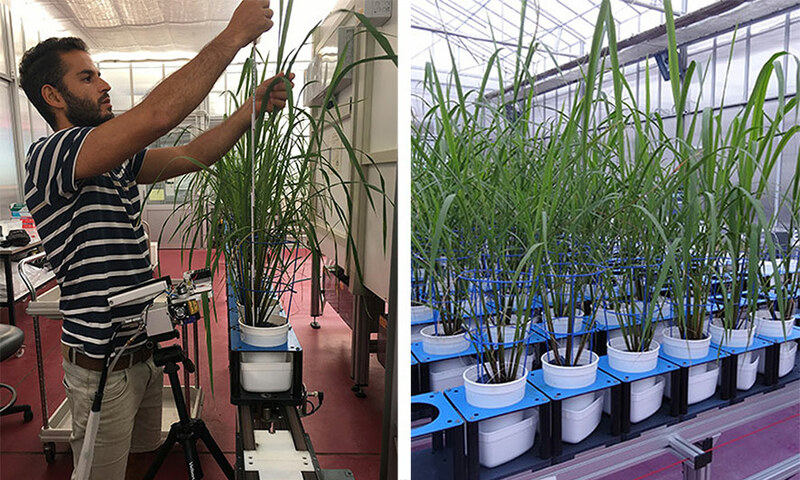 The goal is to identify variations in key genes conferring salt tolerance by investigating these remote populations of native rice. Irrigated cropping, which provides approximately one-third of the world’s food supply, is particularly vulnerable to salt stress. Millions of hectares of high-rainfall coastal regions in south and southeast Asia are left uncultivated or return very low rice yields due to soil salinity caused by changes in weather patterns and increasingly frequent ocean surges. And the challenge is not restricted to Asia, soil salinity is widespread in rice-producing areas globally. Attempts to improve the salt tolerance of Asian rice, Oryza sativa—the most salt sensitive of the major cereal crops—have met with limited success due to the complexity of the trait and a limited range of salt tolerance among O. sativa lines. “I believe that natural biodiversity is still an under-exploited, sustainable resource that can enrich the genetic basis of cultivated plants to improve productivity and resilience”, said Yoav Yichie, who undertook the project within his Postgraduate Internship Award with the APPF. Naturally occurring variation among the more than 20 wild species of the Oryza genus has vast potential to provide breeders with novel genes to improve resistance to salt. 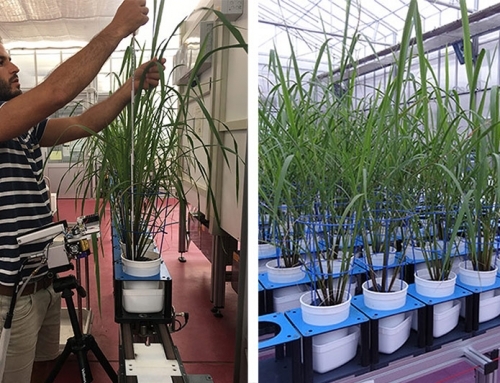 Through two distinct screening experiments, the research team investigated variation in salinity tolerance among accessions of two wild rice species endemic to northern Australia, O. meridionalis and O. australiensis. One population of O. australiensis had salt tolerance that surpassed even Pokkali, the standard salt-tolerant O. sativa used in experiments, with O. sativa cultivars Pokkali and IR29 providing salt-tolerant and sensitive controls, respectively. Surprisingly, the two screenings uncovered striking diversity in salt tolerance among the Australian wild rice accessions tested across a range of salt levels. 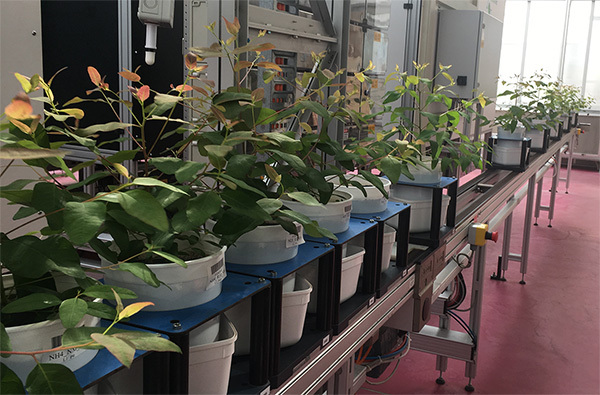 This approach corroborates the use of image-based phenotyping as a valuable tool for quantitative screening of abiotic tolerance in plants. 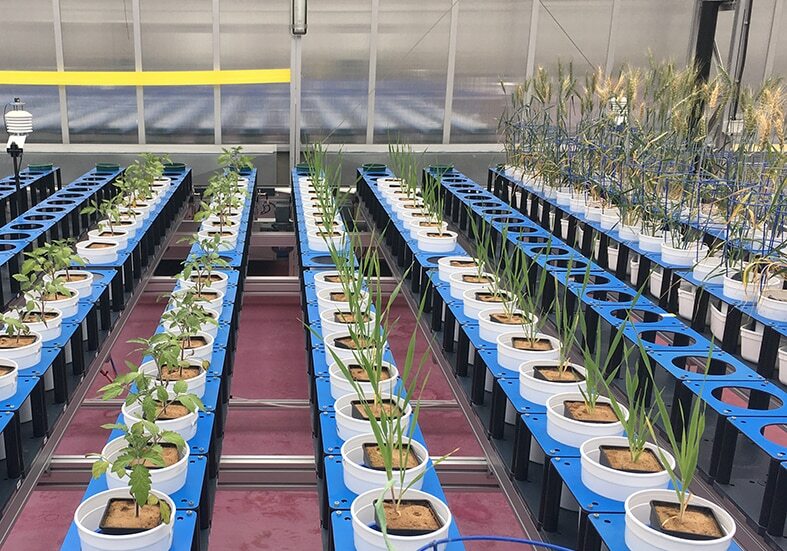 It also highlights the benefits that will come from using exotic germplasm to provide new genetic variation for salinity tolerance in rice. The team is collaborating with the International Rice Research Institute (IRRI) to map important tolerance QTL/gene/s. 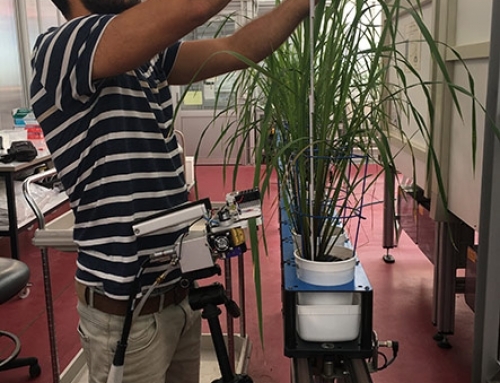 “The use of the plant phenotyping technology at the APPF has laid the foundations for the next stages of this exciting and important project which will one day help farmers grow rice in saline areas”, said Yoav. 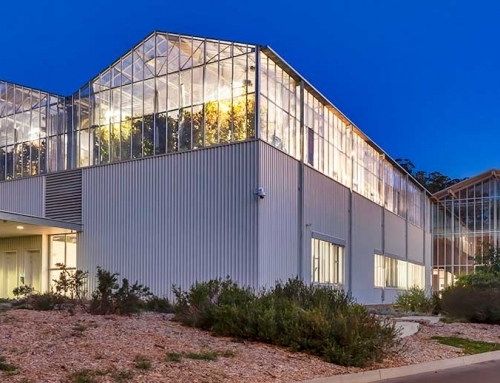 (Left) – Yoav Yichie taking measurements of the rice plants in one of the APPF’s high-throughput Smarthouses located at the University of Adelaide‘s Waite Research Precinct. 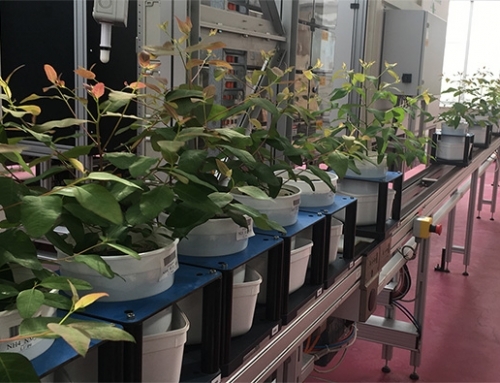 (Right) – The research team’s rice growing in the Smarthouse.